The Texas A&M Transportation Institute (TTI) Advisory Council is comprised of a small group of high-level transportation professionals from across Texas and every sector of the transportation world. The council, which meets annually, offers a tremendous service to the Institute by advising on transportation issues and trends and supporting TTI’s research programs and initiatives. 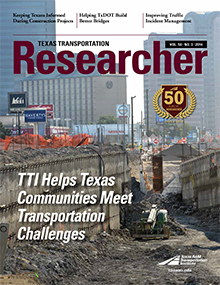 TTI profiles several council members in each issue of Researcher. Mike Heiligenstein leads the implementation of innovative, multimodal transportation solutions that reduce congestion and create transportation choices that enhance quality of life and economic vitality in the Central Texas region. He has been with the Central Texas Regional Mobility Authority (CTRMA) since its inception as an independent government agency in 2002. Before taking the helm at CTRMA, he served the citizens of Williamson County for 23 years as a public official. During his years of public service, Heiligenstein initiated and helped supervise $1.5 billion in capital improvement projects. He serves as the 2014 president of the International Bridge, Tunnel and Turnpike Association. Oscar Trevino owns and manages O. Trevino Construction, which has a strong background in heavy/highway contracts and an emphasis on concrete paving. He has served as mayor of North Richland Hills, Texas, since 2002. He serves on several boards and committees, including the Coalition for Better Transportation, the executive committee of the Tarrant Regional Transportation Coalition, the National League of Cities transportation infrastructure and services steering committee, and the North Richland Hills Capital Improvement Program committee. As director of the Harris County Toll Road Authority (HCTRA), Gary Trietsch leads the improvement of mobility in the greater Houston metropolitan area by ensuring excellence in the operation of urban toll highway systems, while upholding a commitment to leadership, public service and quality of life. Prior to joining HCTRA, Trietsch served as vice president for the Dannenbaum Engineering Company for five years and spent 40 years with the Texas Department of Transportation (TxDOT), serving the last 13 years as the Houston district engineer. At TxDOT, he managed projects covering six counties and having a $1 billion budget, including one of the largest freeway traffic management systems in the United States — Houston TranStar.